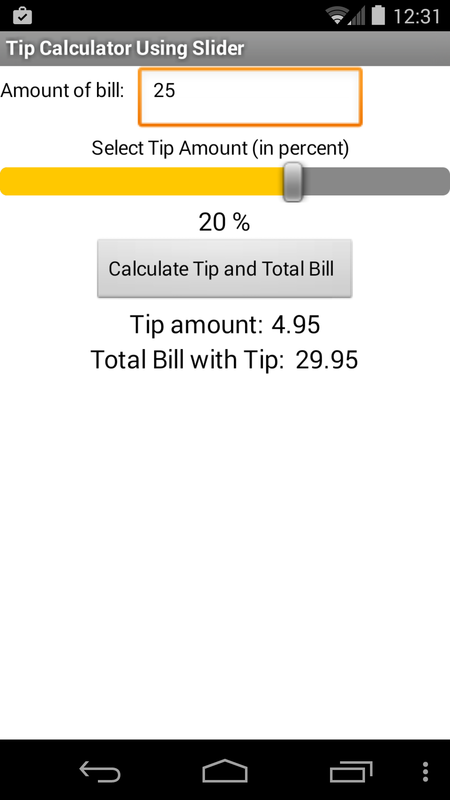 This is the second of 3 apps that implement a tip calculator. 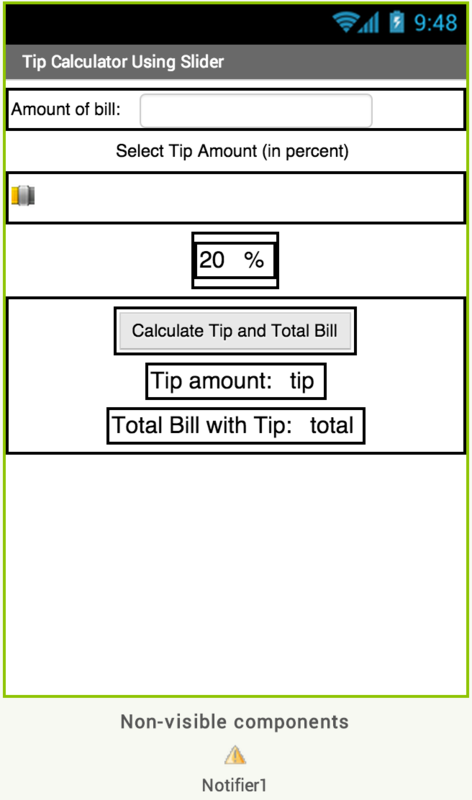 Version 2 (this tutorial) introduces the Slider user interface component to select the tip amount. Using the Slider, the user selects a tip from 0% to 30%. Since there is no text entry, it is not possible for an incorrect tip value to be entered. Version 3 will introduce a way to avoid all user data entry errors – by designing the app in such a way that the user can enter only correct values. We set the tip amount by putting our finger on the “thumb” and dragging the thumb left or right. “Thumb” is the name given to the moveable control that appears on the slider. As we drag the “thumb” control on the slider, the amount of the selected tip is shown – which is 20% in this screen shot. Using this design with a Slider, it is impossible for someone to enter an invalid tip! Use the Width property to set the size of the Slider on the app’s screen. I chose to set it to the full screen width but it could also be set to a specific number of screen pixels. 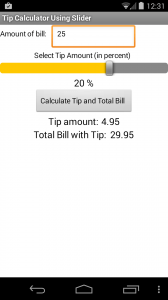 As the slider is adjusted by the user, the current position is updated on the screen to show the selected tip amount. Since the range of Slider values is from 0 to 30, we use the thumbPosition property directly and copy it to the label on the screen. Using the Slider is quite easy! The remaining blocks code is simplified since we can remove the error checking used in Version 1. Instead, we just take the ThumbPosition and divide it by 100 (to convert into a fraction – remember 20% is really 0.20) for use in the calculations.